Only the very best cleaning equipment will do for a pool that is set to host the diving when the Commonwealth Games come to Scotland in 2014 – and after going to great lengths to find the right supplier, Edinburgh Leisure found the perfect partner in Truvox. The Royal Commonwealth Pool, or the Commie Pool as it is affectionately known, recently re-opened after a two-and-a-half year refurbishment, funded by the City of Edinburgh Council and sportscotland, costing £37.2 million. With an average of 28,000 customers per week, cleanliness, hygiene and safety are high on the agenda. It also played host to the British Olympic team training camp in the build-up to this summer’s games – so gold medal standard cleaning was definitely required. The Edinburgh Leisure cleaning team has a huge area to look after including eleven changing aisles, four group changing rooms, a large foyer area, and three fitness studios. 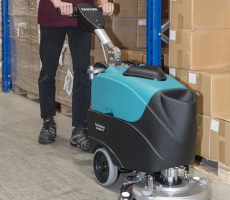 With a variety of surfaces to maintain such as wood, terrazzo tiles and wet areas with non-slip flooring, machines need to be versatile, reliable, and easy to manoeuvre. The venue opens at 5.30am and doesn’t close until 10pm so all cleaning has to be carried out while members of the public are around, meaning that trailing leads would be too much of a hazard. While researching battery-operated equipment, one of the maintenance team mentioned that he had worked with Orbis Battery Scrubber Dryers in the past and been impressed with the results, so Truvox were called. 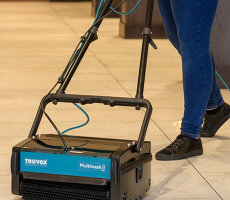 If you have a Truvox product let us know how you're getting on, we'd love to hear from you! Copyright © TRUVOX™ All Rights Reserved Website by Giant Peach. Truvox International Limited will only use your details to keep in touch with you and to provide company updates and marketing information. We will not share your data with any third-party without prior authorisation from you. You can change your mind at any time by clicking the unsubscribe link in the footer of any email you receive from us, or by contacting us at marketing@truvox.com.